Thinking about starting a robotics team at your school? Now’s the perfect time to get started! Read how two coaches led their teams to victory. Want to get your students started coding and programming robots? Enter to win the Start-Your-Own Robotics Club Ultimate Giveaway! So you’re thinking about starting a robotics team. It may be easier than you think and super rewarding, according to coaches Lauren Wade and Frank Tappen. Lauren and Frank not only trained their teams to success, but had a blast doing it! Read our interview with them to learn more about their experience. It may inspire you to start and compete with your own team! 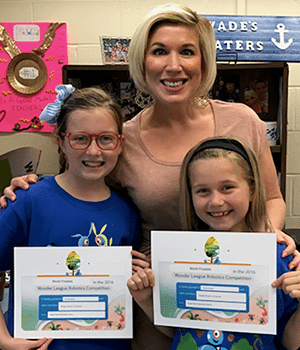 Lauren Wade is a STEAM resource teacher from Ocean Palms Elementary and coach for the Sis Squad (sisters Lily, 2nd grade and Morgan, 5th grade) who tied for first place in the state of Florida and fifth overall in last year’s Wonder League Robotics Competition. 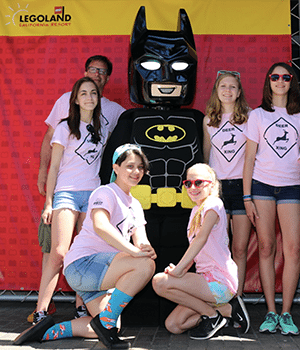 Frank Tappen is a experienced parent volunteer and coach of the Pink Eagles (5 girls from Ore Creek Middle School) who made it to the Michigan state finals and won the $5,000 STEM Grant Grand Prize in the 9-12 year old age group in last year’s Wonder League Robotics competition. Q: What was your jumping off point into coding with robots? Lauren: A teacher at another school told me about these amazing robots she was using called Dash and Dot. As soon as I saw them, I wrote my first Donors Choose grant requesting the robots. My requests were fulfilled in two weeks! As soon as I had my hands on one set of robots, I knew I needed more! Frank: My wife bought me a pair of robots—Dash and Dot—as a birthday present. When I shared the robots with my kids, nieces and nephews, they loved it! I was immediately attracted to doing more with them. Q: How did you get started with your club? Lauren: As our school’s STEAM resource teacher, I get to witness the excitement around robots. I knew I wanted to offer a robotics club for students who were interested. I posted flyers in the hallway and sent out emails to teachers and parents. Twelve dedicated students signed up, two of whom became the Sis Squad. Frank: The Pink Eagles grew out of an extracurricular co-ed team I was already coaching. I quickly recognized that the boys on this team were dominating all of the conversations, programming activities and robot building. So I asked my daughter to reach out to some of her girlfriends to form their own team. The Pink Eagles were born! Q: How did your team begin training? Lauren: Training for the competitions was lots of fun! The students enjoyed getting to know Dash and Dot as they went through the Scroll Quest challenges. These are part of the Wonder Workshop app. I encouraged them not to use the “hints” because that was an easy way for them to find the answers without stretching their thought process. I reminded them that there wouldn’t be any hints during the actual competition. They had to learn to rely on each other for advice and alternate solutions! Once they finished the Scroll Quest, they worked on challenges from the previous year’s competition. Frank: The first thing we did with Dash & Dot was to walk through the tutorials that come with them. Pretty much from the very first program that the girls wrote, they were excited. The programming language was so easy for them, and the robots are so cute! Our “training” often consisted of sleepovers with all-night programming sessions, making YouTube videos, and teaching the robots to play all kinds of fun games, like Marco Polo. Q: What was the actual competition like? Lauren: Once we were actually working on the competition challenges, it was great! The students liked having a clear goal for each mission and remained upbeat and positive. They worked together to brainstorm how to tackle the missions, and worked diligently until they had successfully completed each one. After each challenge I would film and upload their submission video to YouTube. Since the competition was online, there wasn’t a lot of pressure during the actual work sessions. Frank: We divvied up the work. There were 5 missions and we had 5 girls on the team, so each girl was assigned to be in charge of programming one mission and then recording it to submit to the judges. In between, the girls also recorded a number of “outtakes” which captured how much fun they were having. For us, that’s what the competition was really about. Q: What was the biggest challenge for your students? Lauren: As the last sessions of the competition neared, the Sis Squad began to feel the pressure of completing all of the missions. They worked hard on their code until the final two days of competition, when their mother called me to tell me that they were “throwing in the towel.” I begged her to encourage them to finish strong and to send them to me the next day. I met with the girls and talked about the importance of not giving up, and looking at their setbacks in another way. They agreed to give the challenge one more day’s worth of work … resulting in successful completion of the challenge! These two girls actually went on to win first in the state of Florida, and then fifth in the final round of the competition! Talk about motivation to see things through! Frank: I continually told the girls that there were hundreds of teams in the competition and the odds of us winning anything were very slim, so initially we didn’t have any expectations. We had completed all of the missions and we knew our programs worked—that was about it. But then we found out that we were in the winner’s pool for Michigan and the kids got really excited! We realized that this season was shaping up to be something special, and for some girls, their last one. One of our team’s missions is to give back to our community. We invited some of the other Michigan teams that had also made it to the winner’s pool to our meetings to celebrate. We were even invited to an all-girl, high school team’s meeting and got to see how the older girls build robots! Q: Were there any challenges for you as coach? Lauren: I worked with 12 students, four teams in total. It was a bit of a juggling act, meeting the needs of all the teams and coordinating their progress through the challenges. But one of the things that helped was giving as much ownership as possible to the students. For instance, I taught a few of the students to use iMovie so they could create their own videos, then I just had to upload them. Also, as we worked there were definitely some teams that needed to learn how to take everyone’s opinion into consideration. Some of the teams came up with the idea to delegate roles such as designer, coder, and robot control so that everyone had something to do for each challenge. Frank: I realized that the kids were all very busy with many other activities. I didn’t want robotics to feel like a chore or a job that they had to do, so I offered flexible meeting times. The girls could pick and choose the meetings that worked for them, and the challenges would take incremental steps forward because we were always either building or programming (and having fun!) every meeting. Q: Can you share some of the biggest takeaways for you and your students? Lauren: I have learned so much from my students, which is not something that most teachers would admit to. I have to be willing to put myself out there, even when I don’t know all of the answers. We would be learning together. This mentality helped my students to adopt a growth mindset as they approached the competition. They knew that they had to be willing to try and fail forward in every challenge, and seeing their leader in the same boat made that easy. In talking with my students after the competition, they all agreed that their biggest takeaway was that it is important to always finish. Resilience and grit are essential, and the problem-solving skills my students developed will benefit them the rest of their lives. They also created great friendships and bonds with their teammates. Frank: For us, the biggest takeaways were to focus on relationships! We had lots of sleepovers, pizza parties, and team bonding moments. The girls supported each other outside of robotics by attending each other’s events such as soccer games, plays, volleyball games, band concerts, etc. They have become the best of friends! Q: Do you have any suggestions for first time coaches? Lauren: Don’t be afraid to get started just because you don’t have all the answers. If I waited to be an expert myself to introduce these robotic concepts to my students, they would never have gotten to use them and achieve the success that they did. Dive in and learn together! Frank: For teachers who are just starting a team, I can’t stress enough how helpful the tutorials were for the kids. I would also take time to do different types of team-bonding activities. Anything to help the kids become comfortable with each other and to learn how to work well with others is crucial to having productive team meetings. 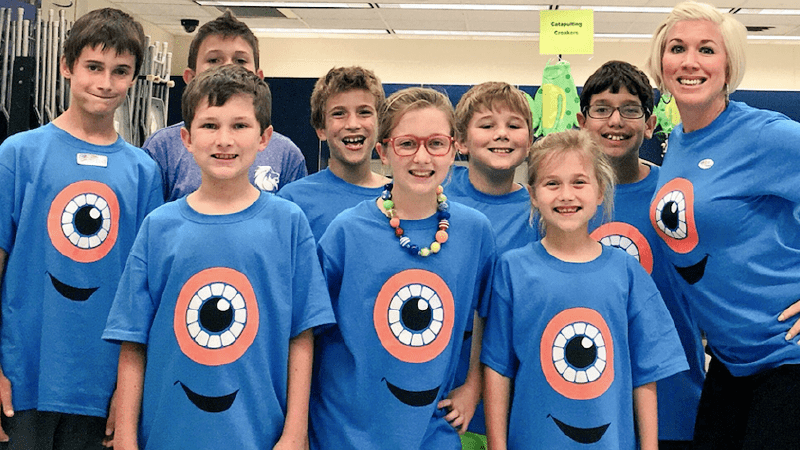 Learn more about Wonder Workshop’s Wonder League Robotics Competition!